When smartphones came onto the scene, it felt like we had finally discovered the one device that would replace all of the others. If your phone is also your camera, computer, and music player—as well as your calculator, flashlight and alarm clock—what other device would you possibly need? Fast-forward a decade and we now find ourselves buying tablets, smartwatches, fitness trackers, smart TVs, and home assistants. However, this isn’t a redux of the days of single-purpose tools—modern devices all connect to each other to create engaging, enjoyable, seamless experiences. Your watch phone syncs with your phone, your home assistant controls your smart TV, and you can copy a link on your laptop and paste it into your tablet’s browser. For retailers competing with the e-commerce giants/kings of convenience, there’s an important lesson to be learned: an ecosystem of connected technologies opens up many more exciting opportunities for innovation than any single, disconnected device or tool can provide. Customer experience improvements drive loyalty and frequency. Store efficiency is about optimizing processes and reducing overhead. Revenue, obviously, is about increasing the bottom line. Some of the prevalent trends in retail associated with these areas include the reimagining of the checkout experience, rethinking how consumers search for and discover products, and cross-channel buying experiences like buy online pick up in-store (BOPIS). These use cases are all more robust and seamless when built around a combination of connected touchpoints. 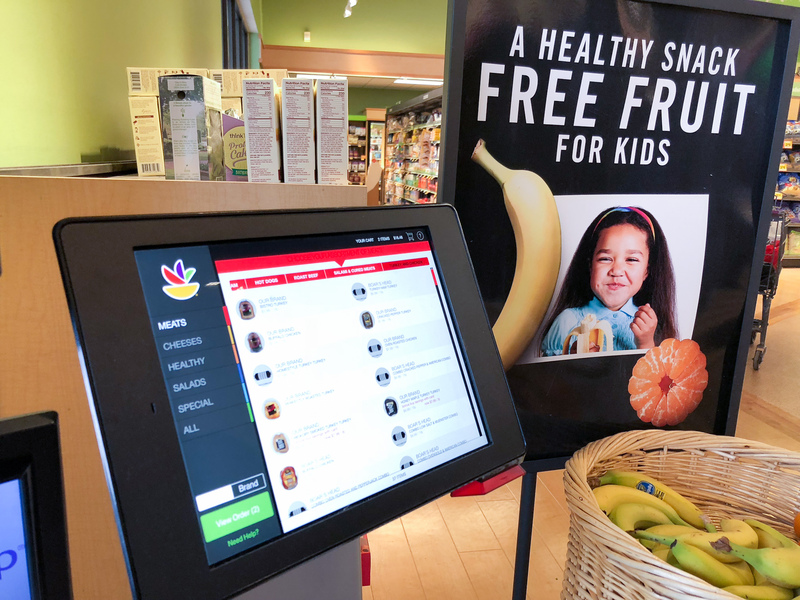 Shoppers might place an order on an in-aisle kiosk and receive a text message on their smartphone when it’s ready for pick-up. They might start an order on a mobile app but then pay for the order in-store. Or, they might reserve an item to be picked up in-store, scanning a barcode or QR code at a kiosk to pick up their order. Regardless of where each specific journey starts and ends, these components can work cumulatively to improve the shopper’s experience and the store’s efficiency along the way. Here are four powerful retail use cases involving multiple devices: click and collect, fitting rooms, custom ordering, and payments. In today’s blended retail environment, many shoppers choose to buy online and pickup in-store. This is a convenient way to shop for items and get them on the same day, especially if the store is located along the customer’s commute. Additionally, this avoids the cost and delay of shipping, which can be deterrents to shopping online. A shopper uses a retailer’s online store or app to make a purchase or reserve items. When it’s convenient, she stops by the retailer’s location for pickup. The shopper can retrieve the item either by scanning a code on her smartphone at a self-service kiosk that is connected to a pick-up locker system. Alternatively she might check in with an associate, who can verify the customer’s order by using a mobile device to scan the order confirmation on the shopper’s smartphone before completing the transaction. For shoppers, BOPIS provides the assurance that the item they want will be available and that they’re getting the best price before ever venturing into the store. It can help save on shipping costs, which can be significant, especially for bulky or heavy items like appliances or groceries. And, like many of today’s solutions, it is simply one more of a range of buying options that empowers shoppers to choose whichever buying experience works best for them at that moment. Beyond improving the customer experience, BOPIS also gives retailers actionable data about shopping preferences and customer order history. This data can be used to recommend other products that the customer might want to buy. Considering that shoppers who use BOPIS often increase their cart on-site before completing their transaction—a phenomenon that has been dubbed the “Target effect”—it can also help drive revenue. The fitting room is the point of decision for many shoppers. A poorly designed try-on experience can lead to lost sales and frustrated shoppers. Additionally, “fitting room fatigue” can drive some shoppers to simply buy first and try on at home. Returned items take time and resources to process and reshelve. Meanwhile, valuable inventory is rendered unavailable for several days, until shoppers return the items to the store. Interactive fitting room technology can help retailers improve the clothes-buying experience—and the efficiency of the fitting room. A shopper enters the fitting room with several clothing items. If the fit or style of an item isn’t just right, the shopper can scan it via the kiosk in the fitting room. This triggers options to request additional sizes, colors, or styles, and to view similar or paired items. Alternatively, the shopper can simply call for help using the kiosk. Associates in the store are equipped with mobile devices. When the customer makes a request from inside the fitting room, the associate is alerted via the mobile device. The alert indicates the items that the customer has requested, as well as the location of the customer making the request. The associate can then retrieve the requested items and bring them to the customer, who never has to leave the fitting room. 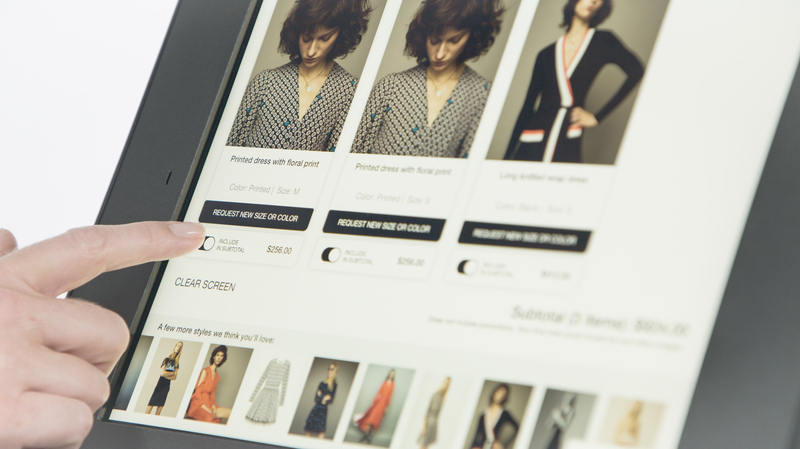 Fashion retailers have a distinct advantage over e-commerce in that shoppers often want to see, feel, and try on clothing in person before buying. However, up to a third of shoppers decide to try on clothes at home and return them later rather than face an uncomfortable fitting room experience. Interactive fitting rooms bring the same great online browsing experience into the physical store. Customers can see online reviews and personalized style recommendations based on their preferences or purchase history, while also getting to touch and try on the garments before committing to a purchase. Grocery delivery services are on the rise. Even still, most shoppers prefer to buy fresh meats, produce, and other groceries in-store. In a typical deli setting, shoppers take a number, wait in line for their number to be called, select their items and, finally, wait for the associate to prepare the items. For today’s busy consumers, this lengthy process is a significant pain point in the grocery shopping experience. With a deli ordering kiosk, shoppers can skip the waiting game. From an in-store kiosk, a shopper scans a barcode on a loyalty card or one that’s generated by a smartphone to check-in. She can then browse deli offerings on the kiosk and is shown her frequently ordered items and personalized offers to quickly place an order. She places the order, then continues her shopping while her order is being prepared. A text message notification indicates when her order is ready for pickup at the deli. 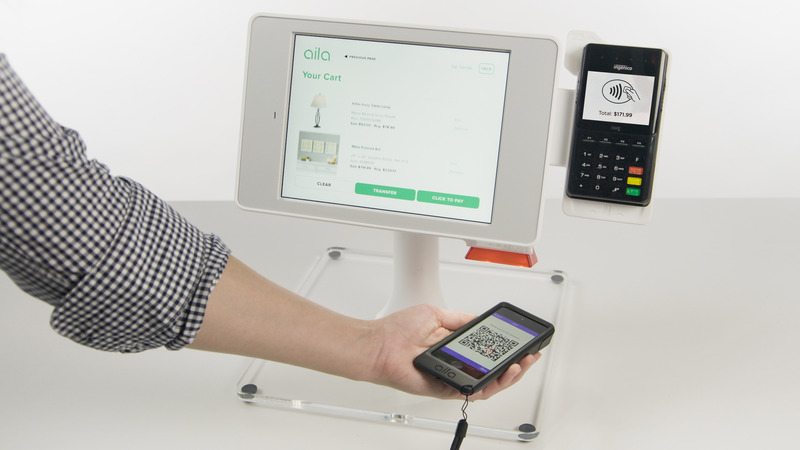 A number of stores have recently started to experiment with new technologies for streamlining the payment process. Cashierless stores, mobile payments, and self checkout kiosks are all seeing use in various retail environments. Companies like Starbucks, Walmart, Target, and Dunkin’ Donuts are enabling shoppers to pay via QR codes with a simple scan of their smartphone. Using a combination of associate devices, in-store kiosks, and shoppers’ smartphones provides a variety of fast, secure ways to check out. mPOS. Associates equipped with handheld mPOS devices can prevent the build-up of checkout lines by processing payment from anywhere in the store. Smartphone checkout. Many retailer apps for consumers can generate QR codes or barcodes that bring up encrypted payment sources. Then, a simple scan of the code on the shopper’s smartphone completes the transaction with no cash transfer, swipe, PIN pad or signature required. Self checkout. Shoppers complete their transaction on a self checkout kiosk by scanning a barcode on smartphone or swiping a credit card. Scan and go. Shoppers scan their phone at a scan-powered turnstile to enter the store. A system of cameras and sensors determine which items the shopper has placed in a bag and then charges the shopper’s account when they exit the store. Like the other multi-device solutions on this list, emerging payment options offer benefits to customers and stores alike. Shoppers gain a variety of fast, secure and convenient ways to complete a purchase, while retailers gain opportunities to improve the customer experience, increase efficiency, reduce overhead, and sync online and physical systems.